It’s hard to get a whole lot more Canadian than using Saskatoon Berries. In fact Canada is probably the only place you can say, “Saskatoon Berries” without having people respond with, “What?”. 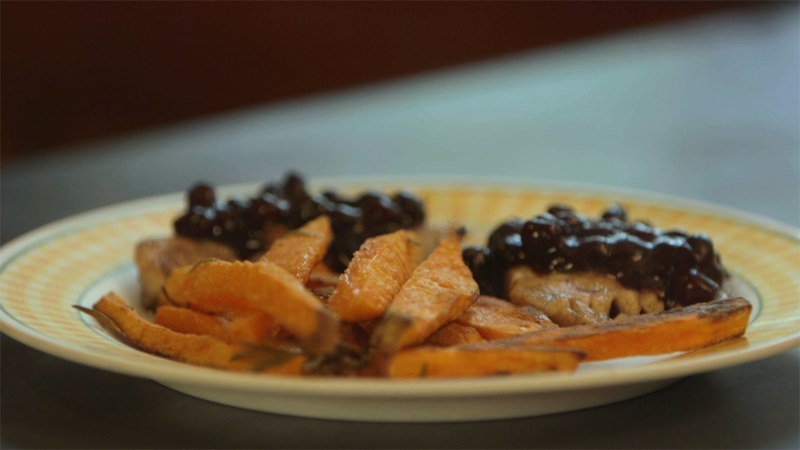 Using yams instead of potatoes and Saskatoon Berries instead tartar sauce, Art makes his version of fish & chips. • Add the berry juice to the saskatoons in a saucepan and bring to the boil. • Add the birch syrup and 1 tbsp. of raw sugar. Allow to boil for ten minutes. • To thicken: pour 1/2 cup water, squeeze half a lemon and add 2 tbsp. cornstarch to a mason jar. Tighten the lid then shake like a mad man. • Add the thickener to the saskatoons stirring all the time until mixture is cooked. • Cut the yam into ½ inch thick slices, roughly peel and cut into fries. • Pop the fires into the zip-lock bag, add the rosemary, oil, and corn flour. Season to taste. • Gently shake the ingredients together and massage until all the firs are covered. • Spread the fries onto a roasting pan – don’t crowd them so they will be crisp. • Bake in 375°oven fro 20 mins, turn over and bake for further 15-20 or until nicely crisp. • Heat your skillet. Melt 1 tbsp. butter – let it brown slightly. Add fillets skin side down. Sprinkle sea salt. • Leave to cook 4-5 minutes depending on thickness and adding more butter and basting if necessary. • Serve the fillets smothered with Saskatoon berry sauce, garnished with yam fries. Fish never tasted this good!